Holmes Hall, which houses the College of Engineering at the UHM campus. 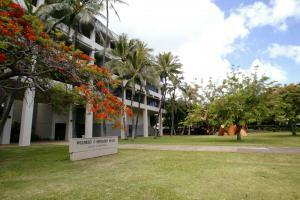 The University of Hawai`i at Mānoa College of Engineering’s graduate programs in civil and environmental engineering, electrical engineering and mechanical engineering have been recognized in those specializations by the U.S. News & World Report’s “Best Graduate Schools 2015” ranking. The magazine’s annual evaluation of graduate school programs in the U.S. will reach newsstands in early April. Civil and environmental engineering was ranked 91st of 99 ranked schools and 140 schools overall. It was tied with seven other programs: George Mason University, Stevens Institute of Technology (Schafer), University of Illinois – Chicago, University of New Mexico, University of Rhode Island, University of Wisconsin – Milwaukee and Wayne State University. Electrical engineering was ranked 89th of 127 ranked schools and 142 overall. It was tied with 11 other programs: Binghamton University - SUNY (Watson), Illinois Institute of Technology, Louisiana State University – Baton Rouge, Oklahoma State University, Tufts University, University of Cincinnati, University of Kentucky, University of Nebraska – Lincoln, University of North Carolina – Charlotte (Lee), Virginia Commonwealth University and West Virginia University. Mechanical engineering was ranked 119th of 127 ranked schools and 160 overall. It was tied with 12 other programs: New Mexico State University, Old Dominion University, University of Akron, University of Colorado – Denver, University of Louisville (Speed), University of New Hampshire, University of Texas – Dallas (Jonsson), University of Tulsa, University of Vermont, University of Wyoming, Wichita State University and Wright State. U.S. News & World Report ranks professional-school programs in business, education, engineering, law and medicine. Specialty rankings are based solely on expert opinions about program quality provided by peer department heads from other schools, selected by the American Society for Engineering Education.